All Medford homes currently listed for sale in Medford as of 04/22/2019 are shown below. You can change the search criteria at any time by pressing the 'Change Search' button below. "(LOT OF POTENTIAL) This Property has a total of 93+/- Acres of Beautiful Rolling Land with a Premium Location in Medford, Near Historic Down-Town and within Approx. Two Miles of Two Local Airports. This Property would make for a Gorgeous Estate, Horse Farm, Solar, High End Homes or Other Planned Communities. There is currently a farmhouse and outbuildings on the Property and the owner is offering to subdivide off and sell the remaining approx. 88 acres for an asking price of $3,499,000. Please see adjacent property also listed for sale MLS# 5458854 Block 302 Lots 26,27,28,49 (152 acres) The two properties combined total over 245 acres with over 1,100 feet of road frontage on Route 541 (known as Medford Mount Holly RD.) Property owner has just completed a new wetland delineation of the complete parcel. All 245 acres has just received a resolution putting the property as an area in Need of Redevelopment. Concept plan attached for the 93 acres and there is 60,000 sq.ft. of commercial that would be great for Self Storage, Medical Office or Specific office use, Emergency Care facility and/or Similar Uses." "(LOT OF POTENTIAL) Block 302 lot 14. This Property has a total of 93+/- Acres of Beautiful Rolling Land with a Premiun Location in Medford, Near Historic Downtown and within Approx. Two Miles of Two Local Airports. This Property would make for a Gorgeous Estate, Horse Farm, Solar, High End Homes or Other Planned Communities. There is currently a farmhouse and outbuildings on the property and the owner is offering to sub divide off and sell the remaining approx. 88 acres for an asking price of $3,499,000. Please see adjacent property also listed For Sale MLS #5978343 Block 302 Lots 26,27,28,49 (152 acres) The two properties combined total over 245 acres with over 1,100 feet of road frontage on Route 541 (Known as Medford Mount Holly Road. Property owner has just completed a new wetland delineation of the entire parcel. All 245 acres has just received a resolution putting this property as areas in need of Redevelopment. There is a concept plan attached for the 93 acres and there is 60,000 sq.ft. of Commercial that would be Great for Self Storage, Medical Office or Specific office Use, Emergency Care Facility and/or similar uses." "This custom lakefront property of unprecedented scale & exceptional architecture, with grand entertaining spaces & unobstructed lake views, will impress the most discerning of buyers. The interior is infused with sophistication while the outside will beckon you to enjoy the manicured lawn and panoramic views of Braddock Mill Lake from numerous terraces and balconies on the rear of the home. Maryland fieldstone & blue stone is on full display throughout the property. The interior is open & airy with 11 ft ceilings on the 1st floor & 10ft on the 2nd floor. Refined design details include: Custom milled 14-inch moldings throughout; 8 ft doorways with Rock Mountain hardware; quarter cut oak flooring; & fully custom wool carpeting. You will love the 6 stone fireplaces (1 wood-burning, 5 gas) with a 50ft. chimney extending from the ground floor through the 2nd level. The Vermont-sourced timber beams in the Family Room are a dramatic focal point. Additional features include: box beam ceilings; Andersen 400 windows; architect designed Lutron smart lighting system; premium controlled music system; 6-zoned HVAC; dual hot water heaters; & wiring for back-up generators. The Dining Room has full wall temperature-controlled wine cabinet with custom lighting & display flexibility. An additional 3500-bottle wine cellar with redwood racking system is at the ground floor! A full bar in Family Room has a mini Subzero fridge & sink for convenient entertaining. The Kitchen is designed for the chef with Woodmode designer cabinetry, Wolf 6-burner gas top w/ skillet, double Sub Zero Ref & separate Freezer; Wolf double wall ovens with warming tray; Butler/Service pantry with Brookhaven cabinets. The 1st floor Library boasts gorgeous lake views & custom built-ins. The Owners' suite includes cathedral ceilings, fireplace, walk in closets, lavish bath w/ fireplace, & stall shower with 4 body sprays. All additional bedrooms have walk in closets. The Princess suite features a full bath plus Jack "
"2+ Acre Waterfront Estate at The Bluff overlooking gorgeous views of Centennial Lake! Enter the paver driveway with its circular go-round and you will notice the homes southwest gray stone finish with brick inlay. Inside this magnificent Bob Meyer beauty is a first-floor master and a full upper-level master with a separate gym. The first-floor master features luxury bath, generous closet space, and wonderful views! The upper level offers a Japanese soaking tub and sauna. The gourmet Woodmode kitchen will delight any chef, double ovens, warming tray, huge pantry, coffee express, island with granite tops, upgraded appliances, separate steam oven and separate breakfast room and pocket office! The dining room can host 20+ guests, the formal living room is comfortable and elegant from its molding and lighting, wood floors and fireplace. The marble floors shine in the gallery hallway leading from the study to the master. The family room offers 20-foot ceilings, fireplace, and incomparable views!!! Once you return home after a hard day, spend time in your relaxing renaissance conservatory with optimal glass and heated floors. Enjoy sunset views overlooking the lake and views of your ponds and waterfalls. The upper floor features 3 additional bedrooms and 3 full baths, 1 of which can host as an upper-level master. Also on the upper floor is a private entry au-pair suite similar to a Manhattan apartment with private bath, bedroom, living room, kitchen, fireplace, and laundry. Don't forget the 3 car garage, an elevator that accommodates all levels, back up generator, an incredible full basement plumbed for future bath, heated floors, Pella doors and windows, your own private dock and over $200K in landscaping. The list is entailed so please contact the listing agent for a detailed sheet. This country French Style Estate is priced for today's market! Come enjoy the water views!! Additional Rooms: Exercise Room/6th Bedroom 18x17 Upper Floor, Study 17x20 Main Flo"
"The essence of elegance and excellence. This custom built Gary Gardner is the creme-de-le creme. 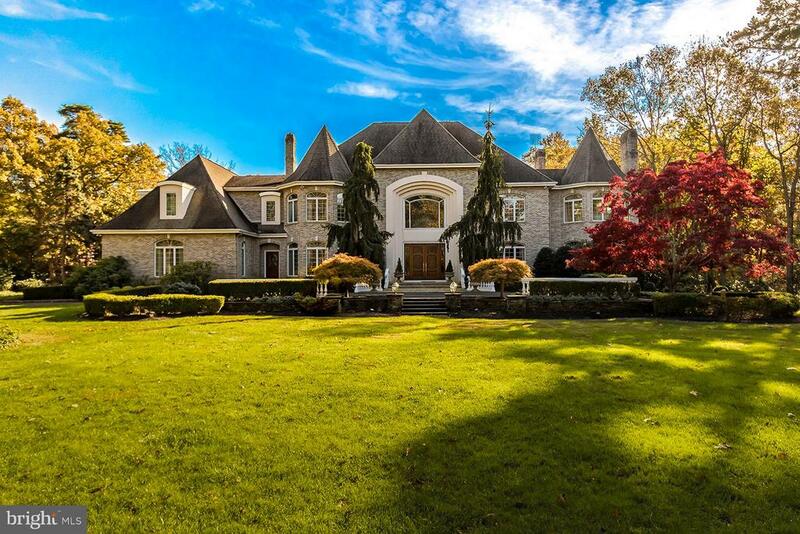 Located in the prestigious Woodsfield neighborhood, this stately manor sits on 2.30 acres with over 9,180 square feet of living space, plus an unforgettable finished basement. This home features 5 bedrooms (all with full baths), a main floor Au Pair suite, numerous Schnobeck chandeliers and sconces,7 gas fireplaces, wood crafted bar and billiard room, 12 seat theater, gas heated 3 car garage, and a master bedroom suite with separate his and hers bath suites. New slate patio, inground pool, cabana with kitchenette and full bath, 5 zone HVAC- 3 zones new past 5 years, Control 4 smart home system,soaring ceilings, custom handmade built-ins and millworking throughout. 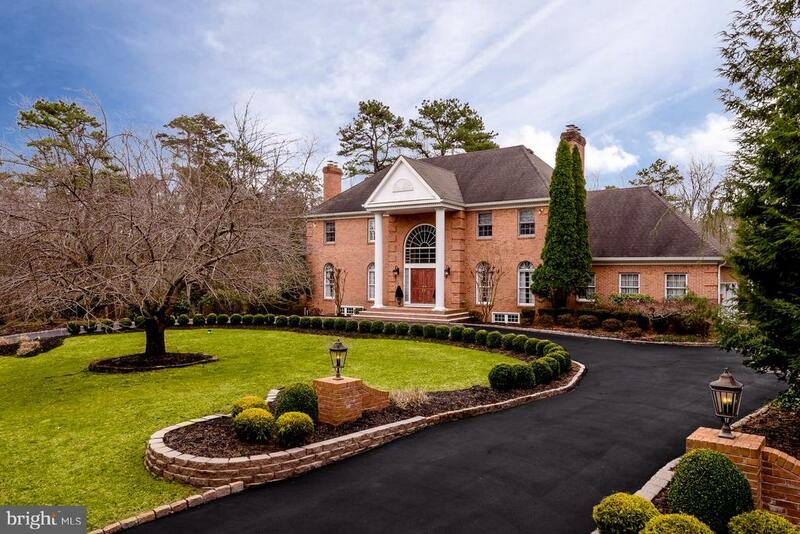 A circular drive leads to this brick manor with side turned garage and brick Paver front entry. Enter via the hand carved double doors to an opulent 2 story center hall with double bridal staircase and balcony view from the upper level. A beautiful Schonbeck chandelier reflects the natural light coming from the second story palladium window. This home boasts 8 crystal Schonbeck chandeliers and 6 crystal Schonbeck sconces ~ since 1870 Schonbeck has been synonymous with authentic, handcrafted crystal chandeliers of the highest heirloom quality. Gleaming hardwood floors grace this grand entry and this flooring is throughout most of the main level. A pillared entry leads to the formal living room, this cozy room says, ~Stay a while!~The formal dining room is designed for lavish entertaining with gas fireplace, chandelier and wall of windows overlooking the front grounds. Don~t miss the music room located off of the foyer with floor to ceiling widows all around, a gas fireplace and chandelier. There~s no telling what you~ll cook up in this dream kitchen. Abundance of Wood-Mode cabinetry, island prep area with veggie sink, Thermador 6 burner gas range with cabinet matching exhaust hood, warming oven, Bosch dishwasher"
"Medford's Hidden Treasure, truly a place for all seasons. 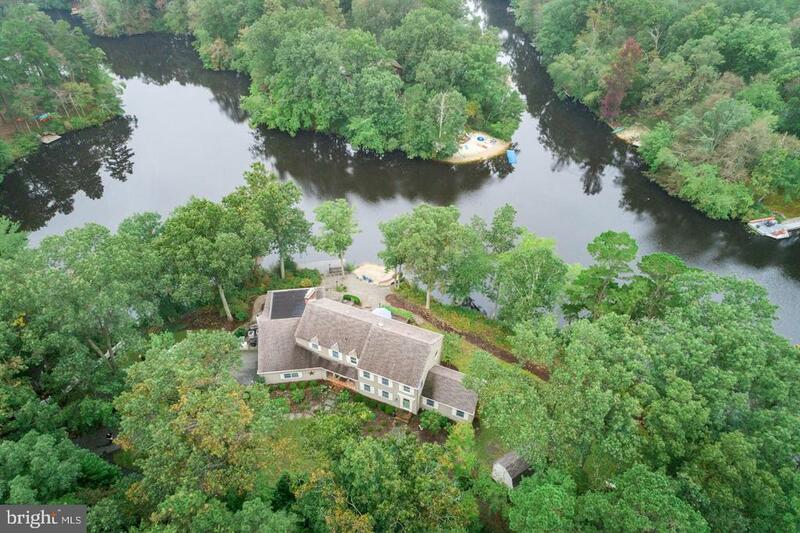 Overlooking a stunning view of your private 4 acre lake surrounded by an additional 17 acres of landscaped grounds, woods, and nature for a total of 21 +/- acres in the center of Medford, is absolutely amazing. A custom built Victorian style home featuring wrap around porches on both the main and second floors provide the perfect vantage point to appreciate the beauty and tranquility of this property. As you enter the home you are greeted by a magnificent two story foyer adorned in oak walls and intricate woodwork from which you easily access a lovely and spacious formal dining room with alcove. The newly renovated professionally equipped kitchen is the place you can show off your culinary skills, top of the line appliances, 2 dishwashers, 2 sinks, wine refrigerator and so much more! Off the kitchen is a fabulous 4 Season Room, where you can sit and take in the breathtaking views of the lake and surrounding grounds. The living room features a dramatic cathedral ceiling with a stone floor to ceiling gas fireplace. An elegant parlor, full bath, and bed/game room complete the main floor. As you enter the 2nd floor you will find the master suite which features a gas fireplace, a master bath with ceramic accented 2 person Jacuzzi / garden tub, a 10' X 9' Oak walk-in-closet, and sliding doors to the 2nd floor wraparound porch. Two additional bedrooms, a full bath, and small library area complete the second floor. Finished walk up attic to the 3rd level offers additional space for office or media room. A detached 2 car garage and a separate storage shed provide ample room for vehicles and property maintenance equipment. Launch your kayak or simply float off into the lake from your private beach, or stroll out on your pier and fish, life is great on your own lake." "A MASTERPIECE! With such exquisite touches you will be both awed and inspired! Designed to impress yet built to entertain this house is extraordinary, spectacular, A MUST SEE! This Travarelli built estate is located in sought after Centennial on 3 acres and boasts 4500 int sq ft, not including the incredible Tuscan style fully finished basement. Be Impressed as you drive up your long driveway located at the end of a quiet cul de sac. Enter into the soaring, expansive 2 story foyer and you will immediately notice Brazilian Cherry gleaming hardwood flooring that flows throughout the home. A beautiful 2-sided gas fireplace greets you as you enter! Custom mill work, arched doorways, 4 fireplaces, vaulted and and hand painted ceilings & walls that adorn each room gives each room of the house its very own personality. A showpiece for all to see! A few unique areas of the main level include a formal dining room w/ designer wall covering & a custom hand painted accented ceiling. An impressive formal living room w/ a gas fireplace & custom millwork. A gourmet kitchen w/ highlights that include a cathedral vaulted ceiling, granite counter tops, custom designed back splash, granite topped kitchen island, WOLFE gas range & a huge pantry. The adjoining breakfast room offers amazing views of the backyard paradise and flows effortlessly into the spacious family room. This room features a gas fireplace, soaring ceilings & again gleaming hardwood flooring. The main floor office provides privacy yet has sliding doors to a private backyard deck that allows you to enjoy the serenity of the totally peaceful backyard. A powder room, laundry room and over sized 3 car garage complete the main level. The second floor features a private master suite. Some of the fine features of this gorgeous room include a tray ceiling, dressing room w vanity, gas fireplace, and 2 walk in closets. A luxurious master bathroom features a Double custom vanity, coffee bar, Jacuzzi and a multi head shower wit"
"Be prepared to fall in love with this custom designed home located on a premium home site on the 4th green of the Little Mill white course. This beauty boasts a fabulous location with unparalleled living space both inside and out. The curb appeal is exceptional and the expansive grounds are breathtaking; it has the feel of a private resort retreat. Situated on a premium 1.46 acre home site in Club Estates, this home boasts nearly 6,000 square feet of living space on the first and second levels with an additional 2,454 finished square feet in the lower level and ample unfinished space for storage. This home has only the finest in quality appointments and with nearly every possible amenity. As you approach, take note of the paved drive that can accommodate 12 to 15 cars in addition to the three car/four bay garage. The slate walkways and stone tiered hardscaping add to the understated elegance of this home. Step inside into the large foyer with soaring curved staircase to the upper level. The formal living room is to the left and overlooks the front grounds with the dining room to the right. The kitchen is at the heart of the home and is truly spectacular featuring abundant glazed cream cabinetry, contrasting wood island, 2nd prep sink, 2 garbage disposals, 2 dishwashers, double ovens, microwave, refrigerator, pantry and a butler's pantry with wine cooler. The counters are granite and the backsplash isTravertine . A breakfast room overlooks the gorgeous rear grounds with sliding doors leading to the rear terrace. A rear gallery leads to a media center, passage door to the four bay garage, and a full bath. A second washer/dryer is located here - so well planned for bathers coming inside from the pool with towels and bathing suits through the side passage door! The two story family room boasts a huge palladium window which floods this room with natural light. There are custom wood cabinets flanking one wall while the adjacent wall features a gas two sided fireplace "
"Better Than Ever! !This is an opportunity of a lifetime. It is rare that a home on the Gold Coast of Medford comes up for sale. 1 Bluff View is a spectacular family home on Centennial Lake. This custom built home features 4173 square feet of living space on the 1st and 2nd floor with another 2100 sq.ft. of finished space in the basement. The anticipation builds to excitement once you walk in the front door and see the open floor plan with high end finishes at every turn. Oak flooring, over sized moldings,Glass french doors,custom built ins, vaulted ceilings,2 fireplaces, 3 sets of open staircases, one of a kind light fixtures, the fabulous goes on including the chefs kitchen with Brookhaven cabinets, Decor commercial appliances including the commercial range with a custom decorative hood finish,Sub Zero refrigerator, granite counters, wine refrigerator. This home is perfect for entertaining for holidays or for any large group. Take advantage of the 2 powder rooms and the open stairs to the full finished basement with multiple gathering areas, bar/craft sink and another full bathroom. Perfect for the sleepovers. Great space! The second floor has a tasteful hardwood balcony with built in custom bookcases and open rails to the foyer and the great room beyond. Their is a prince or princess suite with a private full bath room and a Jack and Jill set up with a shared bathroom. The owners suite is a true get away with a large sitting room and bed chamber area with trey ceilings,chandelier and views of the woods and water. His and Her closets and even His and Her bathroom vanities, whirlpool tub and the shower/spa for two. Take the rear stair case past the 2nd floor laundry room to the first floor mud room that enters in from the awesome breezeway link that connects the home and the 3 car garage. I love this space. 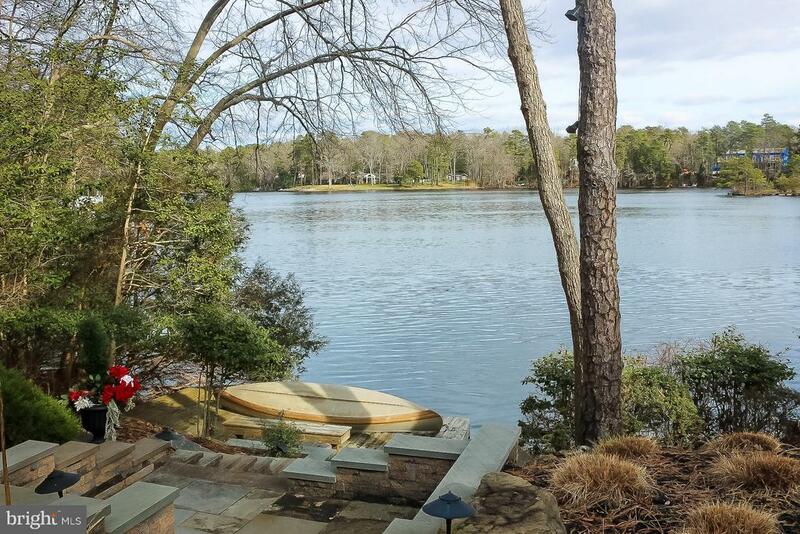 Finish you tour of this property with a short wilderness walk down The Bluff hillside to your private dock overlooking the vast span of Centennial Lake directly a"
"Superb craftsmanship, top of the line materials, eye-catching design & great location equals the perfect stately home. Gorgeous Gary Gardner built home is beautifully custom designed & ready to impress! Enter into the open foyer & take notice of the custom wrought-iron & wood railing on the bridal staircase & magnificent Schonbek chandelier, crown molding throughout most of the house, hardwood flooring that flows throughout many rooms, custom window treatments, 10 foot ceilings, beautiful paint finishes that are like works of art & whole house entertainment system with iPod integration/both indoor/outdoor. Features include 5 BR with master main floor suite. This blissful retreat includes sitting room with huge walk-in closet w/built-in shelving/drawers & luxurious master bath with heated floors, Jacuzzi tub plus double sink vanity. Unwind in the great room with its hardwood flooring, cathedral ceilings, custom limestone fireplace, custom built-in entertainment center & custom wood arched breakfast bar with granite counters and custom lighting & wet bar. The formal living room is breathtaking with its soaring two-story ceiling & custom-built limestone fireplace. The floor-to-ceiling windows offer tremendous views of backyard paradise. The sunny gourmet kitchen features high end appliances such as a Jenn-Air Range & Sub-Zero refrigerator, a huge walk in pantry, separate kitchen island w/under mount sink, granite counters, designer backsplash & abundance of custom cabinetry. An elegant music room completes the main level. Four more spacious bedrooms can be found upstairs. Step outside to your own private resort, which has been featured on Medford Township's Garden Tour. The breathtaking grounds focus on a custom-built Gunite in-ground pool with deep blue finish, hot tub and waterfall.The breathtaking & private grounds have been professionally landscaped & contain custom exterior lighting. Plus large deck, EP Henry patio paver's, wrought iron fence surrounding the back "
"Exquisitely remodeled home in Centennial II, with a design that could grace the pages of any home magazine. The timeless appeal of traditional style has been updated with a splash of on-trend, modern choices throughout this 5 bedroom, 5 full bathroom home which features a breathtaking kitchen, au pair/in law suite, full finished basement and inground pool. Classic architectural details include extensive custom millwork throughout such as crown molding and coffered ceilings, as well as 6~ white oak hardwood floors and ceiling treatments. Your jaw will drop as you step into the heart of the home, where the kitchen, breakfast room and family room provide an open space for your family to create memories. 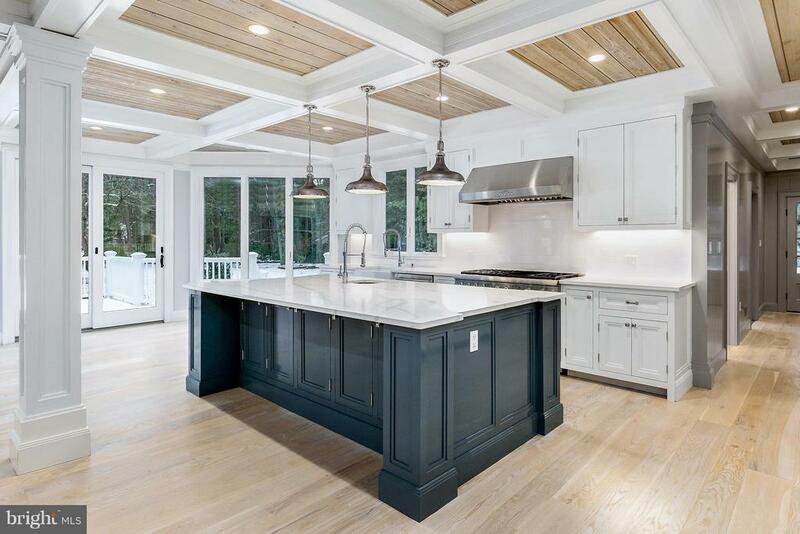 This chef~s kitchen is gorgeous - custom crafted white, shaker style cabinets w/ soft close drawers and doors, Quartz countertops, contrasting gray island, large scale subway tile backsplash, farmhouse/apron sink, and a seamlessly integrated refrigerator are just a few of the highlights. High end, professional Thermador appliances were chosen with the most distinguishing home chef in mind. The 6-burner gas range with center griddle and two ovens, takes center stage across from the over-sized island w/ tons of storage and seating. The adjacent breakfast room features a built-in piece to display your favorite dishes. Open to both the breakfast room and the kitchen is the amazing family room with stone surround fireplace, vaulted wood clad ceilings, and walls of sliders leading to the covered side deck and pool. The main floor also offers a stylish formal dining room, sunken living room with gas fireplace and built-in storage, convenient main floor bedroom w/attached full bathroom and covered porch access, powder room, large laundry room and mudroom with a side entry exterior door. The back staircase provides semi private access to the 2nd floor au pair/in-law suite with a kitchenette, sitting area, bedroom, laundry, full bath and storage. Down the hall are the princes"
"Once in a while, a property comes on the market to answer the dreams of those discerning buyers looking for a waterfront residence of distinction. And here it is! Offering an unparalleled lakefront location and unique architectural quality, this stunningly beautiful property sits on 1.26 acres and is certain to delight. Boasting 300 feet of lakefront, a private beach and dock, panoramic water views abound. Turn up the winding 350 foot driveway - there is so much to see before you reach the house ~ a babbling stream cascades down a rocky waterfall before tumbling over cobblestones across the drive ~ the charming boat house sits nestled among native trees. Follow the driveway to the attached garages or sweep around a small landscaped copse and take in the front elevation of the custom home. To the rear, a walled two tier paver patio off the wonderful screened porch and landscaped grounds offer an entertaining paradise ~ while the private beach and boat dock are only steps away. Once inside, you will see the lake from every room except the laundry room and 3rd and 4th bedrooms! The spacious, meticulously kept accommodations afforded in this 3700 square foot residence include gleaming 9~ pine floors in the kitchen and wide plank oak flooring elsewhere. Wainscoting, chair rails and crown moldings can be found throughout. There are three fireplaces ~ wood-burning in the living room, and wood-burning stoves in the large farmhouse breakfast room and family room. The main hall opens to the beautiful living room and hallway to the open, gorgeous dining room overlooking the lake and mud hall/laundry, with separate entrance to the side front porch. A turned staircase leads from the main hall to the upper floor. The second front entrance opens into the stunning farmhouse kitchen, with new custom Woodmode cabinetry, butcher block counters, subway tile back splash and American Standard farmhouse sink. Please note the kitchen appliances will be replaced with new stainless appl"
"This Home offers privileges to Centennial Lake Beach area and Centennial Lake. Impressive Custom Home with custom brick fa~ade, features details like no other home. Brazilian Cherry Hardwood floors T/O first floor. Custom special Trim T/O the Home, Details include two barrel vault archways flanking the Two sided fireplace in the foyer to the Gathering Room. Gathering room with 14' high ceiling and a wall of windows overlooking the in-ground heated pool, a set of double French pocket door leading to the Study with a second Fireplace. Custom Kitchen cabinets, granite counters on the Island and perimeter counter top, D~cor and Bosch appliances, sliding Andersen door off the Breakfast area that takes you to the Pavers patio and the in-ground pool with spa, the Pool and Spa with natural Gas heath. Andersen high efficiency windows, Kohler fixtures in all Baths, detailed curved archways with large custom trim leading from the Foyer into the living room and dining room. Wainscoting and chair rail in the foyer, dining room, main staircase, and main bedroom vestibule area. 2 fireplaces, one is a see-through from the Foyer to the Gathering Room and the second Fire Place is the Study. The back staircase takes you to the second floor just off the Main Bedroom. Master suite offers gorgeous Italian tile bathroom w/soaking tub, a makeup sitting vanity, Custom Tile Shower & an over sized walk-in closet. There are 3 additional over-sized bedrooms, and two additional bathrooms on the second floor. Heavy custom moldings T/O the Home,4 walk-in bay windows, Brazilian cherry hardwood floors at upper foyer with Two custom niches for your artwork. Finished lower level w/room and a large game room space with full bath and walkup steps to the back yard and the in-ground pool, 75 gallon Gas hot water heater with recirculating pump, high efficiency multi zoned HVAC and Central Air. Architectural landscaping and Aluminum Fenced yard. Alarm System, 300 Ampere Electric, EP Henry patio, irrigat"
"Here it is!! Your opportunity to own a stunning Historic Estate home with so many upgrades both inside & out! Featuring: 4 bedrooms, 2 and one half bathrooms, over 3 and a half acres with an in-ground salt water pool, a 3-car garage that can fit 4 cars with an office/ bonus room and a full bathroom, 2 huge barns, a large garden, a patio with a portico and a beautiful 20 tree orchard! Enter into this stunning house and be awed at the open foyer with custom wood package and original (and gorgeous) hardwood flooring that flows throughout the house. Formal living room with gas fireplace and dining room are both spacious and sunny and bright. A wood burning stove is the focal point of the fabulous kitchen and professional grade appliances including 2 ovens and a commercial grade stove along with a refrigerator and plenty of custom-made cabinetry will bring out the chef in you! A spacious family room is perfect for entertaining with its one of 4 fireplaces (this one gas), hardwood flooring, gorgeous wood beamed ceiling a full bar with a built-in commercial bar refrigerator, sink and antique cabinets. This wonderful room accesses a lovely 3 season sun room (with electric heat) that overlooks the backyard oasis. A quaint sitting room, a library with a wood burning fireplace & built in bookcases and also a large walk in pantry complete the main level. Upstairs you will find: 4 spacious bedrooms including a luxurious master bedroom , with a deck that overlooks the rear gardens. The 4th bedroom features 2 large cedar closets, A walk-up attic offers space for 2 more additional bedrooms or can be a recreation room or room for storage. The full basement can add to your entertaining options. A Professionally landscaped yard features a wonderful garden, an in-ground salt water pool, a patio with portico and lush landscaping! The expanded 3 car garage can fit 4 cars and there is additional room in the driveway for 3+ more cars! The garage even has its own office/bonus room wit"
"Welcome home to the ultimate in luxury and leisure. This is your unique opportunity to own a single family home in the prestigious Wyngate Active Adult Community by Bob Meyer with all the luxurious appointments you enjoy now, and the relaxed low maintenance lifestyle you desire. Nestled on a private cul de sac with wooded, protected space and pond views, this customized Castell II Story European design is beautifully landscaped with tiered paver steps leading to the front entrance. Open the door to a world of elegance. The foyer is timeless and classic displaying an octagonal tray ceiling, wainscoting and chair rail. Lovely hardwood floors flow throughout the public areas of first level, which showcases a study, guest bedroom with private bath, separate powder room. The foyer leads to the rear of the house featuring an open floor plan with expanded dining room, Gourmet kitchen, Great Room with gas fireplace, breakfast room leading to the sunroom. Off the sunroom is a private deck where you can drink in the views, and enjoy the privacy of the fields, wooded areas and ponds. The first floor Master Suite has his and hers walk in closets, spa style Master Bath with frameless shower. There are 2 hardwood staircases off the foyer. The first leads to the upper level of this home, where you will enjoy a large private loft, full bath and 2 spacious bedrooms. The 2nd open staircase off the foyer leads to the lower level where you will discover great workout and entertainment opportunities for you and your guests. This lower level foyer flows to the rear of the home, which opens to an expansive entertainment room with stone gas fireplace with raised hearth, areas for dining, a restaurant size hand crafted bar with beverage and wine chillers, a separate wrought iron gated wine room, with hand carved tasting table, grottos for wine, as well as a hand painted wall mural, a gym room, full bath, and several storage rooms. The patio from the lower level introduces another dimensi"
"A truly unique custom built home located on Tauton Lake with 4 Bedrooms, 4 full baths, indoor pool, formal living & dining room, huge custom kitchen, sunroom, walk out basement, private office, 2 car garage is located on pristine grounds. Each room in this home provides spacious living, the foyer has 2 story ceilings with custom arch windows, chandelier, Wrought iron and wood curved stair case, 2 coat closets and a heated ceramic floor. Walk through the arched doorway into the formal living room that features hardwood floors, a bow window with window treatments, crown molding, built in shelves and custom textured painted wall. Hardwood floors, crown molding, textured wall and faux paint are found in the formal dining room. The large kitchen has heated ceramic floors, recessed lights, corian counter-tops, large windows with spectacular lake-views, center island with breakfast bar and cook top, sub zero refrigerator, custom cabinets, with patio doors to the large wood deck. The family room has a gas fireplace with stone surround, built in corner cabinet and custom built-in shelves. The main level of this home also features a huge laundry/mud room, a wonderful sunroom that has patio doors to the front and back patios, gas fireplace, 3 walls of windows and ceramic floors. The in-door pool room has exposed beams, cathedral ceiling, skylights, glass green house curved roof on one side, 15'x 30' pool, hand painted murals and a full bath, with access to the basement which has a finished billiards room with sliders to the back patio, and excersize room and plenty of storage areas,backyard has a pond, dock and great views of the lake." "Your very own 31 wooded acres in the heart of Medford. This 4/5 bedroom, 5.5 bath estate is an extravagant display of custom craftsmanship, & could be your paradise! Impressive features make this a home like no other. Approach from a private street to a setting that welcomes you with grandeur & classic style. The manicured grounds exceed your entertaining needs with an inground gunite pool with waterfall feature; extensive paver patio surround; expansive premium Zuri maintenance free deck; gazebo; meandering hardscaped walkways; serene stone waterfall sitting area; & an irrigation system to keep it all lush. Inside, the sweeping front veranda leads to an architectural masterpiece, both grand and comfortable. Enjoy the gleaming maple hardwood flooring, a dramatic bridal staircase with balcony & full rear stairway to the lower level entertaining space. Refined design elements include curved moldings, trims, marble & hardwood flooring, arches, & columns. The sprawling floorplan includes a Formal Living Room with fireplace, large formal Dining Room with imported European crystal chandelier; Family Room with floor-to-ceiling stone fireplace; & an adjacent media room. The Butler's pantry links to the Kitchen with direct access to the rear deck. The designer Kitchen boasts an abundance of cabinetry and granite countertop space, custom tiled backsplash, premium appliances with paneled finishes, a center island, a casual dining counter & a full breakfast room overlooking the rear yard. Also on the 1st floor are the private Library, a Laundry room with built-in work/craft station, a guest suite with private bath, add'l full bath plus a half bath. Upstairs the dramatic landing overlooks the foyer & Great Room. A lavish Owners' suite has coffered ceiling, inlaid hardwoods, double-sided fireplace, luxurious bathroom, & large custom walk-in closet. 2 add'l bedrooms plus playroom and full bath complete the 2nd level. The full lower level entertainment area includes built in media "
"Horse lovers dream! 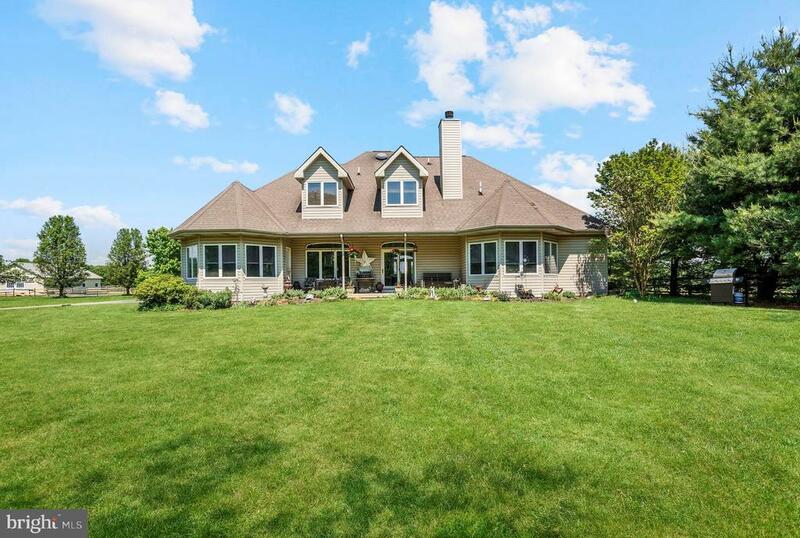 Welcome home to this beautiful property sitting on 11.5 acres in desirable Medford. 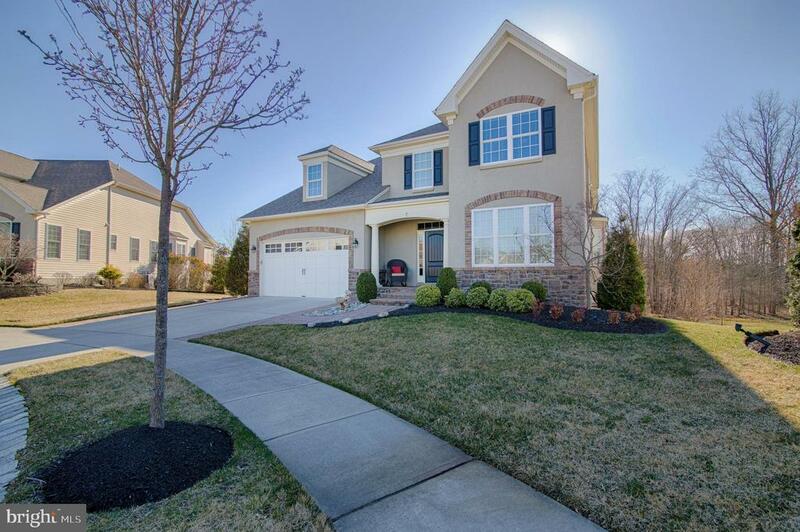 Come up the long driveway to this 4 bedroom, 3.5 bath home. Spacious living room showcases a stone fireplace. Light and bright kitchen features ample space and a sunny breakfast nook. Master suite has a full bath, sinks, soaking tub and stand up shower. Full basement, 2 car garage and plenty of room for storage. Step outside to your 12 stall barn with concrete aisleway, hot water and laundry hook up. There is an additional 6 open stall barn, roundpen, 120 x180 riding arena, 10+paddocks, 2 large tackrooms, office, hay loft and plenty of room to ride. The property is surrounded by woods so plenty of trail riding and nature. The possibilites are endless! Perfectly located to give you that rural lifestyle, yet an easy commute and just minutes from shopping and restaurants." 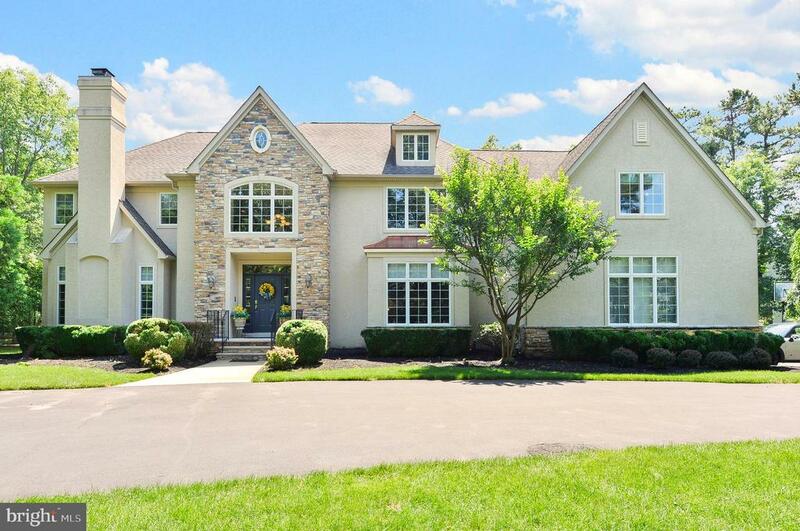 "Simply Gorgeous All Brick Estate in the Centenial II section of Medford Township. This home screams pride of ownership as it has been meticulously maintained by the owners and it shows in and out. This is an Ackerman and Pratt home and it was built as the model home for the development so no expense or option was spared. The interior of this home starts you off with a huge 2-story foyer with marble tile flooring and a wrap around hardwood staircase, to your right is the library with a wood burning fireplace and to your left is the large formal living room with gas log fireplace and floor to ceiling windows which add a ton of light to both rooms. From there you go to the kitchen which has a large center island and has been updated with granite counter tops, cherry cabinets, stainless steel appliances, a tile backsplash, recessed lighting, and Subzero refrigerator. Off the kitchen is a mud room and access to the 3-car garage and open to the kitchen is the breakfast room and the Family room. The breakfast room has an 8 foot French door to the Sunroom and the large Family room boasts a full wall brick fireplace with gas log, a wet bar and custom built-ins on either side and an additional 3 sets of 8 foot French doors to the Sunroom. The first floor also boasts hardwood flooring throughout 3 of the main rooms, crown and chair rail moldings, a neutral decor throughout, recessed lighting, an open floor plan, 9 foot ceilings, a large first floor office off the Living room with custom built-ins and a door the the back deck. Top off the first floor with a 40x16 Sunroom with a vaulted tongue and groove cedar wood ceiling, 5 skylights, a Spanish style ceramic tile floor, a spiral staircase down to the finished basement, and 5 sets of 9 foot sliding glass doors that all overlook the gorgeous backyard. The second floor of the home offers 4 Bedrooms that are all large and a hall bath, the hallway is lined with dental crown molding and leads to a double door master suite. The maste"
"The golf course is a Fore but this home is a TEN! Wait until you see this magnificent Gary Gardner-built luxury home, sitting right on the fairway at the exclusive Little Mill Country Club--one of South Jersey's most acclaimed golf courses. 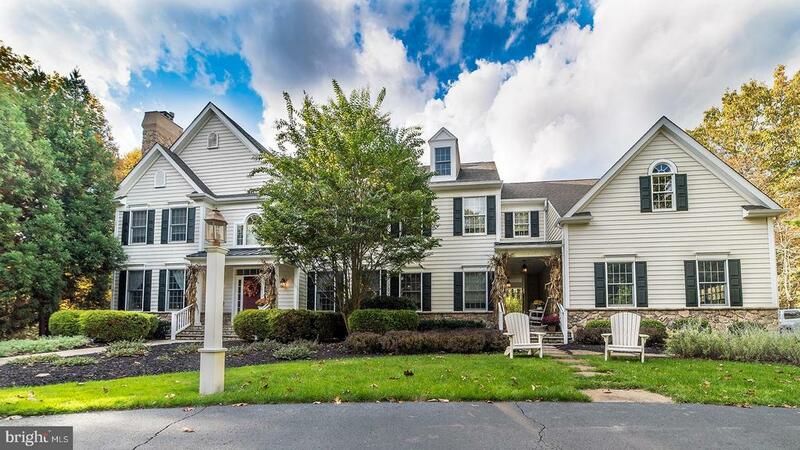 Historic Medford Township is, of course, one of the most sought-after executive communities, and within Medford, there is no neighborhood more highly regarded than Club Estates, home to sports stars and senior corporate executives. This 4,500 sq foot home was built by Gary Gardner, the area's preeminent luxury home builder, and his touches are evident throughout the home. Notice how large all of the rooms are, see the open flow and imagine how perfect this home will be for both entertaining and everyday living. The high columns, soaring cathedral ceilings and top-quality millwork will say to you and your guests, THIS is a bespoke home! Walls of windows let the natural light stream in while allowing you to see the beautiful landscaped gardens and three fairways of the golf course that comes right to your back property line. Step into the expansive chef's kitchen and you will appreciate the finest in appointments, from Wood Mode cabinets to SubZero refrigerator. There is a first-floor master suite and three additional spacious bedrooms on the second floor, including a Princess Suite with en suite bathroom. A second-floor bonus room could easily become a 5th bedroom or a home gym or studio. An additional large ground-floor room will make the ideal study, library or art studio. There is a full basement that is certainly high enough to be finished if you wish. The owners have upgraded the HVAC system in 2014 at the same time adding a new 80 gallon hot water tank, and in 2015 they added an outdoor surround sound--another great feature for entertaining. This home was previously on the market for over $1.1 million, and just just been dramatically reduced to only $799,000! 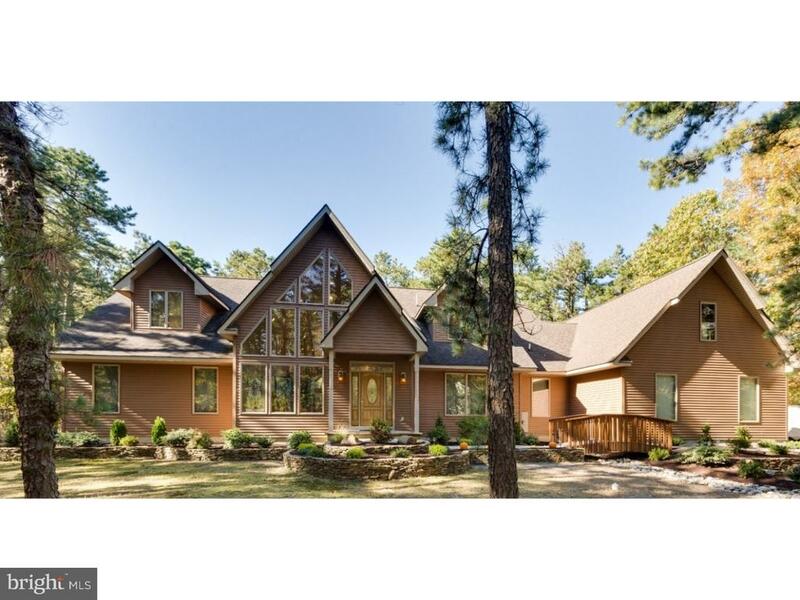 Call TODAY for a personal tour of the home that you will want to c"
"Get ready to fall in love with the great outdoors with this beautiful one of a kind custom home on a quiet, wooded estate of nearly 24 acres. Go fishing on your own personal lakefront. Go hunting on your own pristine land. Lots of space to dream, walk, or simply enjoy nature, peace and quiet, all while being minutes from nearby, shopping, schools, and other conveniences. This 4490 SF home has been meticulously constructed and has been the personal residence for one of New Jerseys top builder's key team members. The lucky next owner will be acquiring an extremely well engineered, energy efficient home built to last a lifetime. Features include 4 bedrooms, 4-1/2 baths, sun room, 2nd sitting room, loft areas, stainless steel commercial appliances, hardwood floors, open floor-plan, massive great room and fireplace, basement with interior stairway to the 3 car garage, loads of sunlight and views, acres of beautiful wooded property, wooded lakefront, 2x6 exterior construction with R22 insulation, and so much more. Neutral interior colors are ready for your personal touch. This is truly a one-of-a-kind. Schedule an appointment to view and make this estate yours !" "Serenity awaits the new owner of this very private property which sits on 1 3/4 acres in the upscale Centennial Estates neighborhood of Medford. Secure gated entryway welcomes you onto a manicured wooded lot including lovely perennial borders with fencing throughout the property. This home has been completely updated by the present owners including an incredible backyard patio that sits right off the kitchen area. The entire home and backyard has a stereo sound system which further enhances the surroundings and environment. This property has a lot to offer with every amenity you could want and is perfect for those seeking peace and tranquility in a private setting!" "Premier custom-built Bob Meyer home in a premier community! You must see this lovely home located on a quiet street with million dollar properties. From the moment you pull up on the horseshoe-shaped driveway, you will take notice of the professional landscaping that is simple yet elegant. Stepping through the front door, the expansive, yet welcoming foyer will capture your attention! The curved staircase is tucked over to the left and the formal living room with columns is immediately to your right. The large main level office with a terrific gas fireplace is off to the left of the foyer, along with a stunning formal dining room. The dining room has bamboo hardwood flooring and a recessed ceiling with built-in lighting that guests will marvel at during your next dinner party. Connecting the formal dining room with the gourmet kitchen is a passageway with a tucked away Butler's pantry. The kitchen is a chef's dream with a Thermador gas stove with a downdraft vent, GE double oven with a convection feature, a Subzero refrigerator, a Bosch dishwasher and a microwave on a lower shelf on the large center island. Of course, there is a long breakfast bar with stools and an adjoining breakfast room that overlooks the deck and scenic backyard. The family room features a gas fireplace, custom built-in cabinetry, and soaring 2-story ceilings with a new ceiling fan. Just around the corner from the family room is a lovely half bath and a mud room. There is a back stairway from the family room that leads up to just outside the master suite. The suite is like no other with a private sitting room, two walk-in closets, a custom tray ceiling and an incredible master bathroom with everything you could want! There are split sinks, a giant walk-in shower, a soaking tub, separate water closet with the toilet and bidet. Just outside the master bedroom suite is the upper floor laundry (but if you prefer the laundry on the main level, there is room in the mud room for it). " "If you are in search of spectacular lake views then you will want to call this slice of heaven on highly sounght after Centennial Lake your new home. You must see this gem to fully appreciate all that it has to offer! The secluded circular driveway leads up to a quaint brick home with a real slate roof. The original footprint has been expanded to maximize the views and provide ample living and leisure space. From the minute you walk through the front door you will be captivated by the charm and the attention to detail this eclectic beauty has to offer. The inviting living room not only has a spectacular view of the lake but it has a beautiful river rock fireplace that adds warmth and character to the room. Hardwood floors cover the entire downstairs with the exception of the full bathroom and the den. The kitchen is flooded with natural light from both the front and the back of the house. Seating for 3 at the countertop allows for conversation to flow while cooking at the gas range in the well-appointed kitchen that has stainless steel appliances and a built-in wine fridge. There~s an office nook for doing homework, playing on the computer or downloading a favorite recipe and just below is a full size table with view of the lake. Just off the kitchen to the back of the house is the den. Original slate floors, soaring ceilings with wood beams, a brick fireplace and stove, a cedar closet, a powder room and yet again more views of the lake make this room one you won~t want to leave. On the other side of the kitchen you can access the dining room with its plantation shuttered picture window and brass chandelier. There is one large bedroom with access to it~s own deck and one guest bedroom situated at the end of the hallway to the right of the main entry that share a full bathroom. A floating wooden staircase will take you to the master suite and to another full suite. Closet space is abundant throughout the house and the master suite has a private balcony where y"